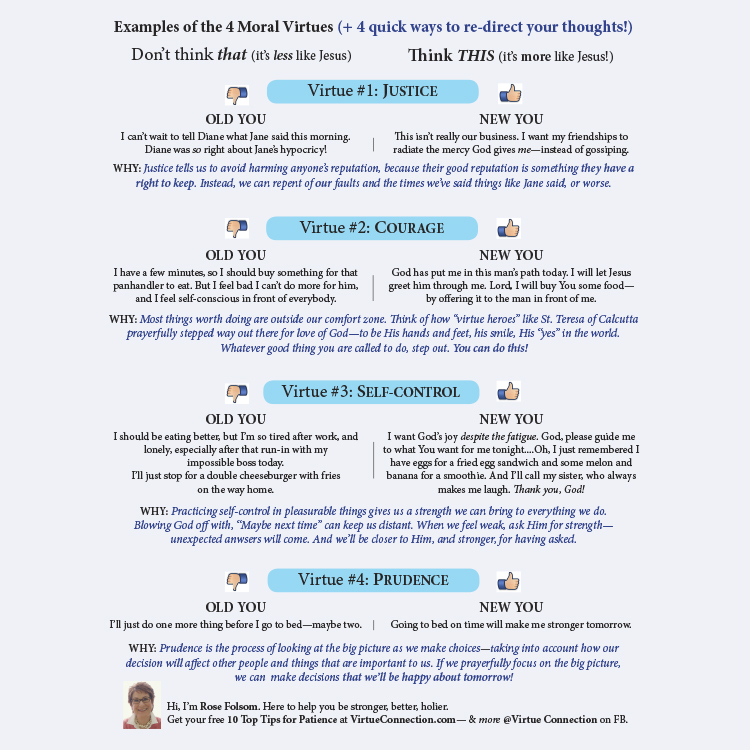 Useful (and kinda fun) Virtue Cheat-sheet! Feb 2, 2019 filed under Fun Stuff. A one-pager with use-now examples of how you can change your thinking on-the-spot from negative to positive in tough situations. Here’s to a stronger, better, holier life — yay! Thank you Rose. Today I was thinking about apologetics and how I am going to retake a class in Thomas Aquinas from the institute with doctor Taylor Marshall online. Hes a very well educated man and speaks a lot of really good things he was in a piscopal priest and now he and his wife and 8 children have been Catholic for the last 10 years. And so he put away the collar put on the tie and now teaches courses and does many other things. A today philosophy is so necessary and Thomas Aquinas is one of our gifts from the mystic his journey short as it was makes him a doctor in the Catholic Church. And I was so very happy to receive your personal quick summary which is so applicable and I was proud to pass it along. Many blessings on you Rose until next time praise be to God. Your thoughts mean a lot to me — thank you! I studied St. Thomas Aquinas for 5 years when I was a new Catholic, and agree that his solid, practical (and mystical) way of expressing the Truth is much needed today. He’s the inspiration for everything I do — trying to put gobbledy-gook theology into plain language that people can actually use to live better life. Thank you Rose! I always look forward to your Sunday emails. It is truly a blessing. I love this weeks comparison on how we are a new creation in Christ. How when we put him fist we practice self control in all areas of our life. We learn that gossiping about others is not of God and practicing self control when it comes to food choices even though we are tired is what God wants for us. Yes, it’s easy to forget that “what God wants of us” is exactly what is best for us in the long run. Even the trials we face. I love the way you put it, “new creation in Christ.” And we are renewed every time we say “yes” to Him. Definitely need to work on a few. Thank you, it answers a lot of my questions. Bless you. Thanks so much for your feedback, Claire. I really appreciate it. That Prudence, Number 4, made me stop to think. Guilty! I’ll try to do better and stick to the same bedtime each day. Yes, too often I look up and say, “How did it get to be midnight?” Let’s pray for each other! Any of these states, usually self imposed, can drive me to seek instant gratification, harming myself and others; often the ones I love. I can kick the can down the road like Esau who in Genesis 25 said “Let me gulp down some of that red stuff; I’m starving,” and thus bargained away his birthright to Jacob who was all too willing to make the swap. I often say that “truth is generic” because God the Father, Son, and Holy Spirit is present (to a greater or lesser extent) in all created things — present somehow in everything true, good, and beautiful. The truth in AA has saved so many souls and, well, I think most of us can relate to Esau! With a grateful heart for all these gentle reminders… especially the virtue of Prudence. But I’ll reflect on all of them! Thank you, my virtuous friend! Your legendary courage, perseverance, and optimism perennially inspire me. Always a delight to hear from you! Please don’t be offended but I had to chuckle when learning of a “cheat-sheet” on how to practice “moral virtues”! for sharing. I think it’s great. God Bless. I have read your sheet of 4 moral virtues and really liked it very much. I did want you to know that some of the text on your “cheat’ sheet is very small and difficult to read. Just wondered if you could make it a little larger? The messages are great!! You are filled with God’s mighty Spirit and strive to help us always!! Love you!! It is a very special presentation, seems like endless human dispositions that could be applied, don’t you think? Wow, great work. I love your cheat sheet idea and found it very useful. It reminded me so much of the Goofus and Gallant section of Highlights magazine….a memory from my childhood which I call upon to this day. The Self Control section hit home with me. Reminding me to seeking God’s help and strength at my weak moments was inspiring to me and gave me hope. Thank you. -Lead off with the “Why” and then the example. For example, prudence has always been a mystery to me. Your “Why” explained it and then the example made sense. -Give more than one example of each…the more the better. Thanks for the great comments. And you’re egging me on for more examples, which I’m happy to do….Maybe this will grow from a cheat-sheet to an e-book! Great idea, Rose! I would call it “Virtue Tip Sheet.” And I agree with a previous commenter who said that the text is small. Might be hard for some folks to read. Blessings! I like “Tip Sheet.” It avoids using the word “Cheat” when we’re talking about Virtue!